Click on the image to go to the Article Online & See what all the excitement is about! Read it here or follow the link to Eastern Fly Fishing's Website! Watch our 2016 Traveling WV Segment by Brad rice on WCHS-TV! Its been a while since our last blog post and we're looking to get back into regularly keeping you guys up to date on the happenings around the lodge, and we're kicking off this years first post with some great news! Our friends over at www.inflatablepaddler.com are putting together a comprehensive list of Fishing Charters and Guides categorized by state for your viewing pleasure, and Knapp's Creek is on the list! Fishing on the water, not in the water, is becoming increasingly popular among both fly and spin casters for a variety of reason including their versatility, ease of use, and sheer number of options available, just to name a few. 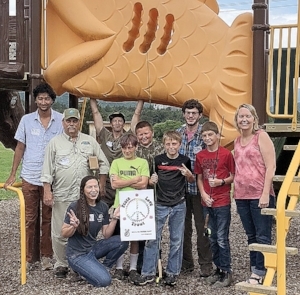 If your interested or even thought about fishing ON the water, Inflatablepaddler.com, is a great new resource to steer you in the right direction be it by boat or wet wading your local stream, be sure to check with them before your next fishing adventure. What's your take on fishing from a boat, yay or nay? Let us know in the comments below! It is spring in the mountains of West Virginia, which is different from spring experienced most anywhere else in the Mid Atlantic. I am sitting in the Sun on the porch enjoying daffodil blooms, vibrant Forsythias, and wild Crocuses- which I can only now see since the snow showers from this morning have melted..
Our business Manager and I returned to the Lodge from our winter season spent in the Teton Valley, Idaho to reopen for Lodge Guests in early March and have wrapped up our first trip of 2016! Dave from Maryland visited with us last year to celebrate with his wife and we were so happy to have him return, this time with his friend from Wilmington, North Carolina, for 5 nights with 3 Full Day Guided Trips and Full Meal Service. As for a trip to start off the Season our approach was baptism by fire and we enjoyed every (mostly) bit of it! The fishing was great on Knapps with trout rising to the top in the evenings to take small grey-bodied dries, mimicking Slate Drakes, and green rock worms and flashy mayfly nymphs below the surface. 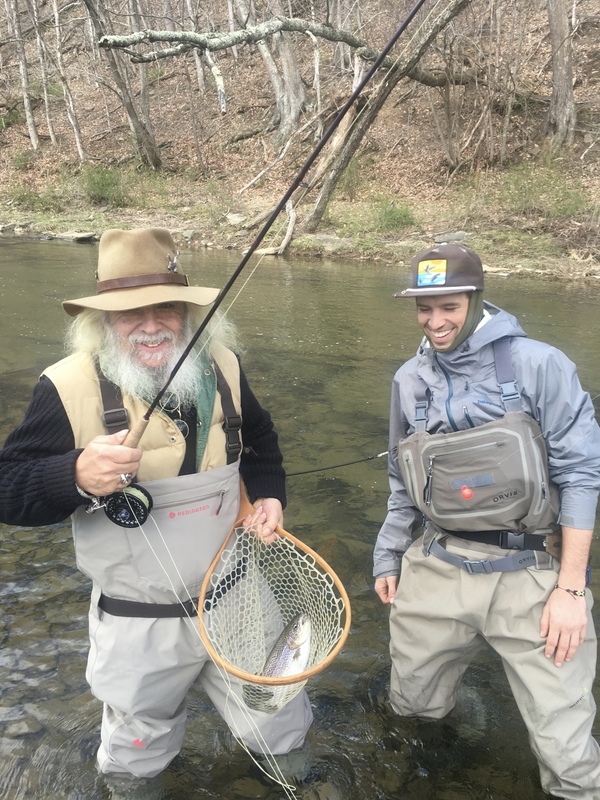 Some of the fishing highlights from this trip included, Jim from NC, though being inclined to saltwater fishing, landed a beautiful Rainbow Trout from our Honeyhole on his first fishing day of the trip! Dave from MD, had great success on his waxed line, bamboo Legacy rod, with an Elk Hair Caddis HE TIED on his trip here last year! Though we enjoyed warmer temperatures most days, we saw a bit of snow on Friday morning and decided to relax with a fire in the Great Room to tie a few flies and "enjoy" a lesson on Knot tying. We usually preach the benefits of general fly/nymph imitators, we sat down with some Nymph-Head Evolution clinger and crawler Mayfly beadheads from Flymen Fishing Co. and were very happy with our results! As for the Nail Knot lesson, I would advise fishermen in investing in a simple Nail Knot Tool for the sake of everyone's enjoyment! Along with a steady stream of fly fishing and Bluegrass, the trip included fresh Rainbow Trout, locally raised Rib Eyes from Rose Beef, and Chicken Kabobs on the porch! A Chef by trade, Jim took our signature Trout Benny Breakfast up a notch! Already showcasing homemade Dilly bread, sautéed Ramps, eggs from our chickens and Lodge smoked Trout, I was taught to make homemade Hollandaise sauce to top it off! Though that is going to take some practice, I am looking forward to mastering it for the menu in the future. Overall, we had a great trip enjoying nature and fellowship and are looking forward to the upcoming visits this spring season!